Accidents abounded on Tuesday morning in the Bay Area - the first big rain of the month. The most significant was when a tractor trailer jack-knifed in Fremont, causing lanes to be closed for more than two hours. The California Highway Patrol reported the accident about 4:30 a.m. on northbound Interstate Highway 680 north of Mission Boulevard. All drivers are asked to use Interstate Highway 880 instead. By 7:15 a.m., the road had been reopened. While Fremont caused the most trouble, there were other rain-related traffic woes as well. 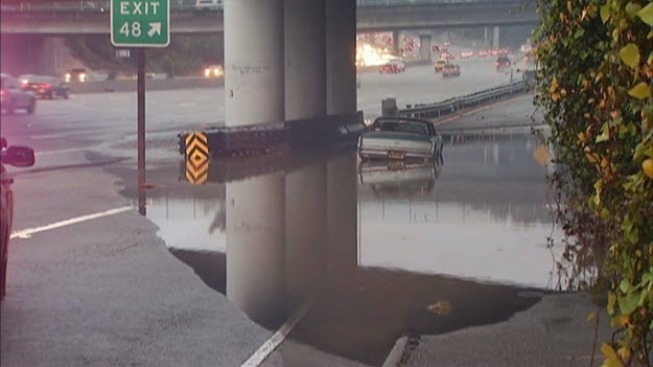 A truck got submerged in a pool of water flooding the Cesar Chavez ramp in Daly City on Interstate Highway 280 about 6:30 a.m. The road was flooded from the John Daly onramp to the Eastmore offramp, where another car also was stuck in several feet of water. Wind advisories were issued for many of the Bay Area bridges because of the rain, which by early Tuesday morning, had pelted down more than an inch and a half in the North Bay. Almost that much was expected to fall on the South Bay by the end of the day as well. Isolated thundershowers will remain in the forecast until late afternoon and evening as the sun begins to set and the lower levels of the atmosphere begin to cool and stabilize. Some showers may linger into early Wednesday, but the remainder of the week should trend warmer and drier as high pressure regains control, according to NBC Bay Area meteorologists. Southern California was hit with a strong Pacific storm system as well on Tuesday, which should also taper off by Wednesday. While it rained a bit on Easter Sunday, the last significant rain to hit the drought-stricken Bay Area was on March 23.